We conclude our series on Parish Boundaries with a response from the author himself. In today's post John McGreevy, the I.A. O'Shaughnessy Dean of the College of Arts & Letters and Professor of History at Notre Dame, responds to the contributors of this city while also reflection how he thinks Parish Boundaries has aged the last twenty years. It’s a pleasure and honor to be here. Thanks to Tim Gilfoyle for organizing the panel and to this distinguished group of colleagues for their willingness to participate and for their shrewd comments. I’m especially grateful to Jim Grossman, whose red pen, in the long-ago days before track changes, improved the manuscript. I first met Jim in his office at the Newberry Library a few blocks from here, 23 years ago. I was thrilled when he and Kathleen Conzen accepted my unwieldy dissertation into the then just starting urban history series at University of Chicago press. I knew he and Kathy would make my dissertation much better and so they did. So how did I get to that dissertation, entitled, as Lila Berman noted, “American Catholics and the African-American migration, 1919-1970”? It’s a short story. I wandered into graduate school, as we might say, without a “research agenda.” I wavered between high school teaching and college teaching and in fact I ended up teaching for a time at Hales Franciscan high school, an African-American Catholic high school on the south side of Chicago. At Stanford I loved the coursework and enjoyed working with superb and generous faculty such as David Kennedy and George Fredrickson, ultimately the first and second readers on my dissertation. But I agonized over a dissertation topic. I did a seminar paper on 19th century populism in California. I did one on draft resisters in California and even wrote a dissertation proposal on the topic. [i] I finally settled on Catholics and race after reflecting on my own life and that of my parents, very much raised in a Catholic milieu, with both of my parents having gone to Catholic grade school, high school, college and, for my father, medical school and then both working in catholic hospitals for much of their professional lives. This Catholic milieu – roughly 25% of the US population and a standard topic in, say, German history -- seemed absent from the literature on United States history. But what would be my angle? Probably no topic seemed as exciting to graduate students at Stanford as “race” broadly construed, and George Fredrickson’s work, and more distantly that of David Roediger, Barbara Fields and others animated late night conversations. [ii] And then like Amanda Seligman I read Arnold Hirsch’s Making the Second Ghetto:Race and Housing in Chicago, 1940-1960 (Cambridge, 1983). Hirsch mentioned Catholics episodically and I started following his footnotes, which led to a full summer going through the Catholic Interracial Council papers in the Chicago Historical Society archives. The late Archie Motley befriended me there and pointed me to other local sources and archives. I even ended up, I should add, marrying and raising four children with a local archivist. So I had a topic. Now to the commentators. Wallace Best accurately notes that I saw my task as to insert “religion” not just Catholicism into twentieth century narratives in US history. I was lucky and didn’t anticipate that religion would become such a central topic – although more in political and cultural history than in urban history -- in the decade or so after my dissertation. Euro-American Catholics and their building of a world in the United States and its disruption by the massive and unexpected migration of African-Americans into that world. The second half of the book details the simultaneous (and at times reinforcing) earthquakes of the civil rights movement and the Second Vatican Council. Amanda Seligman also asks why I tried to write a more national story as opposed to following the marvelous example of, say, Lizabeth Cohen in Chicago or Tom Sugrue whose work on Detroit appeared at the same time as Parish Boundaries. 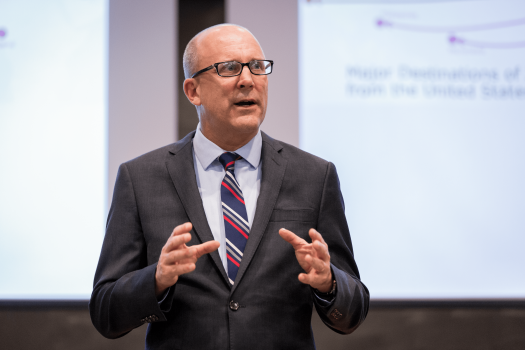 [v] Practically, the decision stemmed from that summer at the Chicago Historical Society, where the papers of the Chicago Catholic Interracial Council opened a window onto a national movement. As a result, I spent a few months staying on friends’ couches and moving from city to city and tracking connections across the urban North. The existence of this liberal Catholic network reaffirmed for the historical importance of the Second Vatican Council, where a generation of Catholic activists saw once lonely work for racial justice lauded even as they came to understand their church and themselves in a different way. Does this story carry up until 2016? I don’t think there will be a second volume of Parish Boundaries, or if so it will be a very different book. What I could dimly see in the early 1990s– the diminishment of the Catholic subculture – is obvious now. The Catholic school system is still the nation’s largest private system, but it’s much smaller and exists in a transformed context of charter and other nominally public schools; Catholic parishes are still numerous but perhaps half as many as at their height in the 1970s; the intensity of Catholic affiliation is much less with 25% weekly mass attendance now as opposed to 70% in the 1960s. The sheer number of Catholics is still impressive because of the Latino migration to the United States, and this process of Catholicism becoming a majority Latino church demands further study. But Latinos are generally less tied to local parish structures and have fewer Catholic schools available for them to attend. In all those senses Parish Boundaries matter less, although with the Catholic church still the largest private landowner in most cities, they do still matter. Euro-American racism remains with us, of course, as the summer of 2016 demonstrated. In that sense tracing the origins of racism – understanding its mutations over time, not simply cataloging it – remains a vital task and perhaps Parish Boundaries will have some continued usefulness in that effort. The last footnote in the book is to Alasdair MacIntyre’s After Virtue, just then becoming influential as a meditation on local communities within the flux of modernity. All local communities – from university faculties to urban parishes -- are by their nature exclusive but historians can focus their attention on precisely how they draw lines and what lines they draw. If I were to advise my younger self I would encourage coming up for air a bit more, recognizing that Catholicism of all institutions is a global one, and that comparisons with other Catholic milieus might have sharpened the book’s analytical frame. Such comparisons might distinguish between the particular characteristics of the 20th century African-American migration into Euro-American neighborhoods and enduring patterns. The twinned impact of migration and the Second Vatican Council in the American context, for example, might help us better comprehend how European Catholics understood themselves in an era of accelerating Muslim migration in the 1960s and 1970s. I recently learned, for example, that even as the Jesuits in Detroit established their initial high school and what would become the University of Detroit in the early 20th century, Egyptian Muslims built the city’s first mosque a few blocks away. [vi] Global Islam, like global Catholicism, is understudied, especially the movement of its ideas, institutions and people across oceans and national boundaries. When I began my career I did so as a 20th century United States historian attempting to bring “religion” into the national story. When I applied for jobs I applied for 20th century jobs. When I listed courses I could teach I stressed the United States survey. That’s still my fundamental guild identity. But I am now convinced that the modern United States history of the future, certainly the modern United States religious history, will flourish even more in a self-consciously global context. [i] John T. McGreevy, “Farmers, Nationalists and the Origins of California Populism,” Pacific Historical Review 58 (1989), 471=495; McGreevy, “The Northern District of California and the Vietnam Draft,” Western Legal History 2 (1989), 384-393. [ii] George Fredrickson,The Arrogance of Race: Historical Perspective on Slavery, Racism and Social Inequality, (Middletown, 1988); David R. Roediger, The Wages of Whiteness: Race and the Making of the American Working Class, (Verso, 1991); Barbara Fields, “Ideology and Race in American History,” in Region, Race and Reconstruction: Essays in Honor of C. Vann Woodward, (Oxford, 1982), 143-177. [iii] Gerald Gamm, Urban Exodus: Why the Jews Left Boston and the Catholics Stayed, (Harvard University Press, 2001). [iv] See Matthew Cressler’s forthcoming work on African-American Catholics in Chicago. [v] Lizabeth Cohen, Industrial Workers in Chicago, 1919-1939, (Cambridge, 1990); Thomas J. Sugrue, The Origins of the Urban Crisis: Detroit 1940-1960, (Princeton, 1996). [vi] Nile Green, Terrains of Exchange: Religious Economies of Global Islam, (Oxford, 2015), 207-234. What a wonderful conclusion to this retrospective series of posts. Thank you for these insights and reflections, Dr. McGreevy, and particularly for stressing the importance of thinking globally when writing and teaching U.S. history. 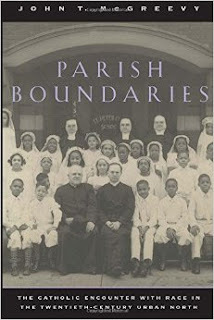 Like many of those who shared their thoughts on Parish Boundaries, I read the book in graduate school and found it critical to my thinking on religion and race in twentieth century America.